Road safety charity The Institute of Advanced Motorists has established that, despite frenetic campaigning, most motorists don’t want blanket 20mph speed limits. IAM research revealed that while UK drivers are very supportive of lower speed limits outside schools, with ninety-four per cent of respondents agreeing that this would be a good idea, half of the drivers canvassed are against a blanket 20mph speed limit with under a third willing to embrace the idea and a fifth are undecided. Male drivers are more likely to be against the idea than female. There was support for 20 limits in areas with high numbers of pedestrians such as parks (34 per cent), hospitals and shops were the next most popular with 21 per cent of drivers in favour. Only eight per cent of respondents opted for 20 mph near cycle lanes. There is a difference between speed limits and zones. Councils have the power to introduce 20 mph speed limits and zones without obtaining consent from the Secretary of State. Speed zones are a collection of streets with a 20 mph limit whereas speed limits are set for individual roads. Some local authorities have set 20 mph speed limits on a number of individual roads so creating blanket coverage of residential areas with a 20 mph speed limit. 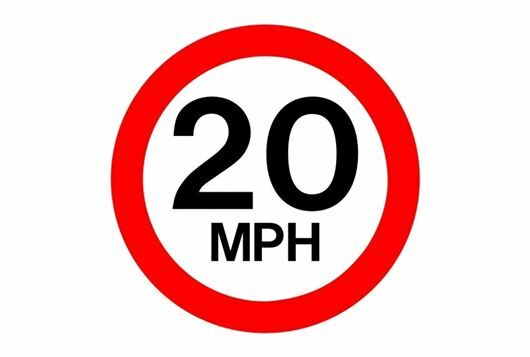 20 mph speed limits can be introduced without any form of traffic calming. In many areas they are being used across the whole area. Whilst not as effective as 20mph speed zones they can still produce significant lowering of speeds over a wide area for very little cost. Compliance is increased by publicity, driver awareness and community involvement. This can and does play a large part in self-enforcement. Certainly traffic calming is a problem. Speed humps damage cars, even at low speed. Pinch points, slalom courses where kerbs are built out and traffic islands every few hundred yards are a nuisance and a danger to cyclists who are constantly being pushed together with car drivers. I know of roads in my area where built out curbs reduce roads to single track on blind bends. I believe roads are safer for everyone if they are kept clear and open with good visibility, minimal signage and road markings and plenty of space for people to get by each other. This means everyone can see each other, avoid each other and not get frustrated. As for the 20mph limits themselves, I don't see that they realistically can be enforced or that it should be a police priority. I live on a housing estate where all the roads are 20mph. People generally stay within the spirit of it but everyone gets up to 23mph which is the speed prosecutions would start at if there was a speed trap. The biggest problems are roads with schools and rushing parents and roads that are used as rat runs. Improving main routes so people don't feel the need to take short cuts through back streets would make a difference, as would alternative ways of getting children to school rather than parents driving them. A bigger issue for me than 20mph zones on small residential streets is main A roads and motorways having their limits cut from NSL to 50mph and below. This really does seem like an unnecessary gesture to road safety without targeting the real issues of driver distraction. On roads near where I live speed limits have been cut simply in response to accident rates and the government's speed limit review. Since then there have been numerous fatal accidents on the roads with drivers under the influence of drink and drugs, mostly late at night, while during the day sensible drivers are slowed down and there is a police speed trap lurking round every corner. I agree with the comment about safe daytime drivers being targeted for being a couple of mph over the limit when boy racers are doing 60+ at night usually at weekends, the only time of the week they can afford petrol I believe, with impunity, not a sign of a cop car, unless it's parked outside a takeaway collecting their supper! As for blanket 20 mph zones it might be better telling and teaching children of all ages that walking off the pavement without looking both ways is tantamount to suicide or serious injury, which is coming more and more common in our area, I myself have several times had close shaves with kids stepping off the kerb without looking to see if it's safe to do so, sorry to say, it's not always the motorists at fault with this type of collision. Fifty years ago, we were taught to respect traffic and not act like brainless idiots when crossing road unlike today when road safety has gone by the board. I couldn't agree more. I actually walked by a school the other day while the children were being taught how to ride bicycles safely on and around the road, which I thought was an excellent idea. Whilst children should be able to play around the roads in residential streets and cul-de-sacs, they ought to be taught respect for motorists as well. My friends and I set up a goal net in the road and played football when we were children, but we kept a lookout for cars and moved out of the way of them. Where I live now, there are some children who deliberately cycle or leap out in front of cars and others who are oblivious to them. Their parents tend to be the inconsiderate drivers who take no care and just charge through sounding their horns at the children, regardless of speed humps and a 20mph limit. Parents with no respect for anyone else never teach their children respect. As long as road safety lessons only extend as far as having children point speed guns at drivers and saying the responsibility for their safety lies entirely with other people, they'll never learn to take care of themselves and keep themselves safe. I also think driving lessons in school time is a good idea for older children. It's done in some schools in the USA. Plenty of organisations offer driving lessons for teenagers under 17 off the road on private grounds. Once children have been taught how to stay safe on the road as pedestrians and cyclists, even just one or two lessons in cars would help give them a rounded understanding of how the roads are for everyone and everyone needs to look out for each other. It should help eradicate the "Them and us" a lot of people have where pedestrians, cyclists and drivers consider themselves breeds apart from each other and enemies on the road. Make 40mph the min, and raise the max to 110 mph, there is no need to waste our time making us drive unreasonably slowly! In an ideal world there would be no need for speed limits because people would be able to drive sensibly to the situations they're in without having to be governed to a specific speed. Speed limits have traditionally been set according to the 85th percentile rule. It's assumed that, while some people may drive unreasonably fast while others drive unreasonably slow, the vast majority are prudent enough to drive at a sensible speed because they don't want to have an accident. The speed limit is set at the average speed of traffic on a road, discounting the fastest and the slowest people, so no one is unnecessarily slowed down by it. Making speed limits lower than most people would drive at on a road, given freedom to choose a comfortable speed, is not only frustrating to drivers, it means too much conscious effort is placed on keeping their speed down and looking out for speed traps and that detracts from looking out for other hazards.